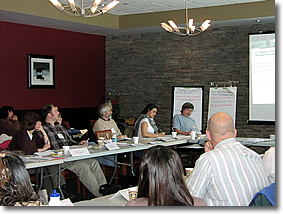 The Social/Cultural Review meeting was held at the Aurora Research Institute on November 8th to 10th, 2006. This meeting brought together ten participants from around the Northwest Territories (NWT) and Yukon to review scientific proposals submitted for funding under the Government of Canada Program for the International Polar Year (IPY). The group reviewed 35 proposals which included all of the proposed research for the NWT and the Yukon North Slope. A set of global conditions were drafted which applied to all proposed research activities in the NWT as well as recommendations specific to each of the proposals. Chris Heron, a member of the Social/Cultural Review team, went as the NWT representative to a Science Sub-Committee meeting in Ottawa. 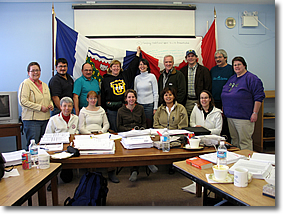 The IPY Northern Node/Communications Workshop was held in Inuvik on March 6th and 7th, 2007. The meeting was funded by both the Federal Program Office and the Department of Environment and Natural Resources (ENR), Wildlife Division, Government of the Northwest Territories (GNWT), and included consultation about the Northern Node as well as information sharing about IPY in the Northwest Territories. The meeting was organized by the NWT Northern Node and the Aurora Research Institute, and included the Node consultation session and a workshop on regulatory and emergency preparedness issues, and community capacity to participate in IPY. Approximately 35 participants were present at the meeting, representing government and communities across the NWT. Representatives from the NWT IPY Advisory Committee also attended the meeting. A separate report about this meeting was prepared by Terriplan Consultants and submitted to the Federal Program Office and ENR.